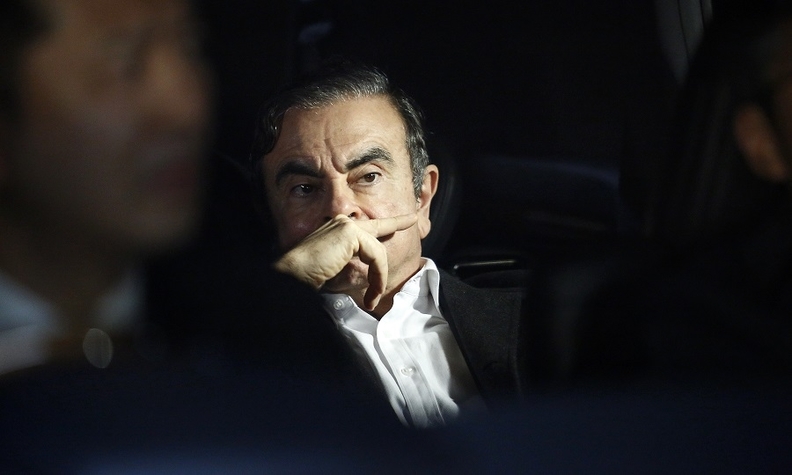 Ghosn sits in a vehicle as he leaves his lawyer's office in Tokyo, Japan, on Wednesday, March 6. TOKYO — Carlos Ghosn, the embattled former chairman of the Renault-Nissan-Mitsubishi alliance, walked free of the Tokyo jail where he was confined for 108 days in a breakthrough that will help him fight what he calls the “meritless and unsubstantiated” criminal charges against him. Ghosn left the Tokyo Detention House around 4:30 p.m. Wednesday, climbed into a vehicle and was whisked away. Television footage showed Ghosn wearing eyeglasses, a surgical mask, a blue cap and workman's clothes — replete with fluorescent orange safety stripes — as a swarm of guards led him to a Suzuki minivehicle in an apparent attempt to camouflage his release. Ghosn, who turns 65 on Saturday, momentarily steered toward a large black van parked nearby before being redirected to the diminutive Suzuki, which had commercial vehicle plates and a ladder lashed to the top. The black van was parked behind the silver Suzuki and was packed with Ghosn's belongings, including blankets and suitcases. It drove away afterward. Hundreds of journalists crowded the entrance of the detention center to chronicle his release as helicopters hovered overhead. It was not immediately known where Ghosn was taken, but the conditions of Ghosn’s release restrict him to court-approved housing. Several hours before Ghosn was freed, the Tokyo District Court announced he had paid the prescribed bail of 1 billion yen ($8.9 million) in cash. The court approved bail the day before, with conditions of limited Internet access, a ban on international travel and video surveillance inside his residence. But the court rejected a last-ditch appeal by prosecutors to quash bail. Focus now turns to Ghosn’s trial, where he will face three indictments on allegations of financial misconduct at Nissan. Ghosn’s lawyer, Junichiro Hironaka, has said a trial could still be months away and speculated it won’t head to court until after summer. In the meantime, Ghosn will likely double down on preparing for the legal battle ahead and use his freedom to tell his side of the story. He already started on the eve of his release. In a statement emailed Tuesday, Ghosn called his arrest and detention a “terrible ordeal” and expressed thanks to his family and friends for standing by him. “I am also grateful to the NGOs and human rights activists in Japan and around the world who fight for the cause of presumption of innocence and a fair trial,” Ghosn said. “I am innocent and totally committed to vigorously defending myself in a fair trial against these meritless and unsubstantiated accusations,” he said. Ghosn’s lawyer had earlier suggested Ghosn wanted to give a news conference after his release on bail. But Hironaka said Wednesday there were no immediate plans for one. In the meantime, the onetime globe-trotting car executive will be kept on a short leash by strict bail conditions. According to the Tokyo District Court and Hironaka, Ghosn must reside in a court-approved residence and have his movements monitored by camera surveillance. He can’t leave Japan and his contact with other people will be restricted. The court set the restrictions, citing concerns of flight risk and evidence tampering. Ghosn’s co-defendant, Greg Kelly, was released on bail Dec. 25. An American director at Nissan, Kelly is accused of helping Ghosn falsify company financial filings to hide some $80 million in deferred compensation. Kelly is restricted from leaving Japan. Ghosn faces a separate indictment for breach of trust. That charge alleges he temporarily shifted 1.85 billion yen ($16.5 million) in personal swap contract losses to Nissan and had Nissan pay $14.7 million to a business associate who allegedly helped Ghosn handle the red ink. If found guilty, Ghosn faces up to 10 years in prison. Ghosn and Kelly deny all charges. Ghosn was removed as chairman at Nissan and Mitsubishi shortly after his Nov. 19 arrest. He resigned as chairman of Renault in January. But both Ghosn and Kelly remain directors on Nissan’s board, because that title can be stripped only through a shareholder vote. Nissan has scheduled an extraordinary shareholders meeting on April 8 to vote on removing both men. Ghosn switched lawyers late last month after his first legal team failed in two attempts to win bail. The new lawyers reapplied for bail last week. Hironaka said the new bail application offered stricter conditions aimed to address concerns about flight and destruction of evidence. Approval of Ghosn’s bail comes amid mounting international pressure on Japan and criticism of judicial practices many say are out of step with international norms. Before indictment, suspects can be held for weeks without charge and subjected to lengthy interrogation by prosecutors in the absence of their attorneys. The high bar for bail is seen as pressuring confessions from those who maintain their innocence. Hironaka slammed Japan’s system as one of “hostage justice” and said the country’s handling of Ghosn’s case would affect Japan’s standing in the court of international opinion. Ghosn's French lawyers also submitted a dossier to the United Nations' human rights office in Geneva that they say shows Ghosn's rights had been violated during detention in Japan. In the first interview after his arrest, Ghosn told the Nikkei in January that he had “no doubt” his arrest was the result of “plot and treason” by Nissan executives opposed to his plan to merge Nissan and Renault. He said he planned to combine them in a 50-50 holding company. Nissan CEO Hiroto Saikawa, in a separate interview last week with Shukan Bunshun, acknowledged there was mounting resistance inside Nissan to Ghosn’s overtures about merging the management of the two companies. Ghosn began raising the idea in February 2018, Saikawa said. Even though Saikawa repeatedly objected to the proposal, Ghosn and Kelly continued to push for it. But Saikawa said his own resistance to any management integration between Renault and Nissan had nothing to do with the charges of financial malfeasance leveled against Ghosn. That investigation, he said, had begun separately in early 2018, without Saikawa’s knowledge. Saikawa said he learned about the allegations only in October, a month before Ghosn’s arrest.